Premier League leaders Chelsea suffered their first defeat of the season as they were beaten at Newcastle in their 15th top-flight game of the campaign. 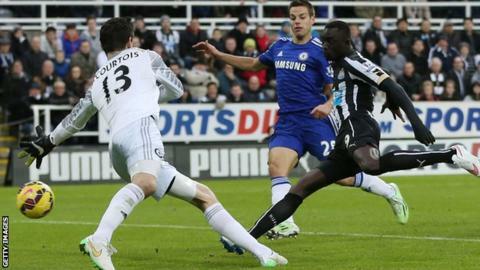 The Magpies took the lead when Cisse slotted in after Gary Cahill missed Sammy Ameobi's low cross. An Eden Hazard shot hit a Newcastle upright before Moussa Sissoko set up Cisse for another tap-in. The hosts had Steven Taylor sent off but, despite Didier Drogba pulling one back, held on for the win. Chelsea piled forward late on and striker Diego Costa had a shot tipped over by 21-year-old goalkeeper Jak Alnwick, who was making his debut having come on as a half-time substitute for the injured Rob Elliot. Newcastle had beaten the Blues in their last two league games at St James' Park but a repeat appeared unlikely considering the marauding form of their visitors. However, a heroic defensive performance, marshalled by centre-back Fabricio Coloccini, was the foundation of a victory which ended Chelsea's hopes of setting a new club record of 24 matches unbeaten in all competitions. The defeat will also end talk of the Stamford Bridge side repeating Arsenal's 'Invincibles' by going the whole league season without losing, and gives the London side's title rivals the chance to make up ground. Mourinho had insisted that it was "impossible" to remain unbeaten all season and he was proven right as his side were frustrated by a disciplined and organised Newcastle side, much in the way they were in a goalless draw at Sunderland last weekend. Before the break, Chelsea were limited to a couple of Willian strikes wide, a Cahill header over and a well-struck Oscar overhead kick past the frame of the goal. The hosts gradually grew in confidence as they quelled the Blues' threat and might have taken a surprise lead. Ameobi found Ayoze Perez and his sliding pass released Colback, but the midfielder was thwarted when Chelsea keeper Thibaut Courtois saved his close range shot with a foot. It was easy to see how Newcastle had lost just once in nine games but they suffered a setback when goalkeeper Elliot failed to emerge for the second half, having injured himself taking a goal-kick. That meant a debut for Alnwick, whose first piece of action was to punch away a Cesc Fabregas free-kick assuredly. Alnwick should have been tested again when another Fabregas free-kick found John Mikel Obi in space at the near post only for the midfielder to head wide. The miss was immediately punished when, at the other end, Cahill missed a low Ameobi cross and Cisse slotted in gleefully. Chelsea exerted more pressure but, 38 seconds after a Hazard shot came back off a post, Newcastle extended their lead when Cisse scored after a swift counter-attack. A Taylor foul on Andre Schurrle earned the defender his second yellow card left the Magpies a man down. And, in a dramatic finale, Drogba gave Chelsea hope when he nodded in a Fabregas free-kick. However, Newcastle stood firm as Mourinho was left still searching for his first league win at St James' Park in five attempts as Chelsea manager. Newcastle keeper Jak Alnwick said his professional debut was "amazing" and "surreal"
Match ends, Newcastle United 2, Chelsea 1. Second Half ends, Newcastle United 2, Chelsea 1. Attempt missed. Didier Drogba (Chelsea) header from the centre of the box misses to the right. Assisted by Filipe Luis with a cross. Attempt missed. Branislav Ivanovic (Chelsea) right footed shot from outside the box is too high. Assisted by Didier Drogba with a headed pass. Attempt missed. John Terry (Chelsea) header from very close range misses to the left. Assisted by Didier Drogba with a headed pass. Corner, Chelsea. Conceded by Cheick Tioté. Corner, Chelsea. Conceded by Ayoze Pérez. Offside, Chelsea. Cesc Fàbregas tries a through ball, but André Schürrle is caught offside. Attempt saved. Branislav Ivanovic (Chelsea) header from the centre of the box is saved in the bottom right corner. Assisted by Diego Costa with a cross. Attempt saved. Filipe Luis (Chelsea) left footed shot from outside the box is saved in the centre of the goal. Assisted by John Obi Mikel. Corner, Chelsea. Conceded by Jak Alnwick. Attempt saved. Diego Costa (Chelsea) left footed shot from the centre of the box is saved in the top centre of the goal. Assisted by Didier Drogba. Offside, Chelsea. John Obi Mikel tries a through ball, but Didier Drogba is caught offside. Attempt saved. Gary Cahill (Chelsea) header from the centre of the box is saved in the centre of the goal. Assisted by André Schürrle with a cross. Corner, Chelsea. Conceded by Paul Dummett. Goal! Newcastle United 2, Chelsea 1. Didier Drogba (Chelsea) header from the centre of the box to the bottom left corner. Assisted by Cesc Fàbregas following a set piece situation. Substitution, Newcastle United. Michael Williamson replaces Sammy Ameobi. Second yellow card to Steven Taylor (Newcastle United) for a bad foul. André Schürrle (Chelsea) wins a free kick in the attacking half. Foul by Steven Taylor (Newcastle United). Diego Costa (Chelsea) is shown the yellow card. Daryl Janmaat (Newcastle United) wins a free kick in the defensive half. Cesc Fàbregas (Chelsea) is shown the yellow card. Goal! Newcastle United 2, Chelsea 0. Papiss Demba Cissé (Newcastle United) left footed shot from the centre of the box to the bottom right corner. Assisted by Moussa Sissoko. Eden Hazard (Chelsea) hits the right post with a right footed shot from the centre of the box. Assisted by Branislav Ivanovic. Attempt missed. John Obi Mikel (Chelsea) right footed shot from outside the box is high and wide to the right. Assisted by Diego Costa with a headed pass. Attempt blocked. Diego Costa (Chelsea) left footed shot from the centre of the box is blocked. Assisted by Didier Drogba with a headed pass. Corner, Chelsea. Conceded by Fabricio Coloccini. Corner, Chelsea. Conceded by Daryl Janmaat. Substitution, Chelsea. Didier Drogba replaces Willian. Substitution, Chelsea. Filipe Luis replaces César Azpilicueta. Corner, Chelsea. Conceded by Sammy Ameobi. Offside, Newcastle United. Fabricio Coloccini tries a through ball, but Steven Taylor is caught offside. André Schürrle (Chelsea) is shown the yellow card for a bad foul. Foul by André Schürrle (Chelsea).